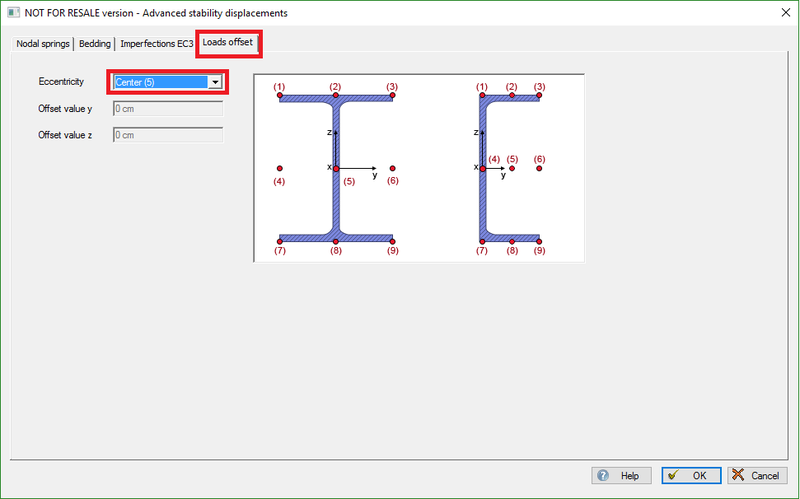 The Advance stability (2nd order analysis) solver from Advance Design has an option that allows users to select the position where the load is applied considering its location from the shear center of the section. This parameter is particularly crucial, as loads applied away from the shear center tend to have a stabilizing effect, while loads applied towards the shear center usually have a destabilizing effect. By default, the ‘Eccentricity’ is set to "Center", signifying that the load is applied to the shear center of the section. The position can be set by selecting any of the default characteristic points (1-9) of the cross-section. It can also be user-defined if Offset values are introduced for the y and z axes. In the study of lateral-torsional buckling of beams, the Elastic Critical Moment Mcr plays a fundamental role; this quantity is defined as the maximum value of the bending moment supported by the beam, free from any type of imperfections. The value of the Elastic Critical Moment Mcr is directly dependent upon the position of the loads point of application from the shear center. This option helps structural engineers simulate more realistic behavior of steel members within structures, which would be very difficult (if not impossible) to achieve by manual calculation alone.